Richland School students once again participated in Samaritan’s Purse Operation Christmas Child. This project is a hands-on way for Canadians to share the spirit of giving with underprivileged children from developing countries throughout the world. 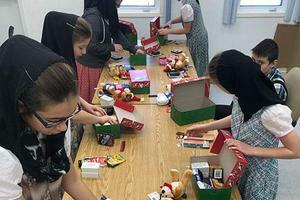 Students participated by packing shoeboxes full of toys, school supplies and hygiene products. Each shoebox also contained a letter written and coloured by the Early Years students. The community of Ridgeland Colony donated generously to make this both a success and a valuable learning opportunity. Operation Christmas Child was established in 1993 and is celebrating its 25th anniversary this year.